The name of the American war plan in 1941 was "Rainbow Five," but it's unlikely this referred to the battleships at Pearl Harbor. Or did it? According to a discovery by historians, the ships of Battleship Row were a bright kaleidoscope of colors, not the dull gray camouflage they were thought to have been for the last 65 years. The information was announced last evening at an unveiling of a new model of the USS Arizona in the battleship Visitor Center at Pearl Harbor. Security was tight for the last week as the model was placed in location, and it was covered in shrouds before being dramatically unveiled by a group of USS Arizona survivors. "Every battleship sailor in the world wants a peek at this," remarked retired Adm. Thomas Fargo to the crowd of several hundred historians, veterans and news media. The model replaces an older, inaccurate model built in the 1960s. Craftsman Don Preul, determined to create the world's most accurate representation of the warship, conferred with Park Service historian Dan Martinez on the proper colors. Research was difficult because most of the ship's records had been destroyed in 1944. "Suddenly, here was a link to something that had troubled us for years," said Martinez. "Then we had it confirmed by USS Arizona aviator Glenn Lane, who was keeper of the paint locker in the aviation section. Not only was the ship blue, but the tops of the No. 1, No. 2 and No. 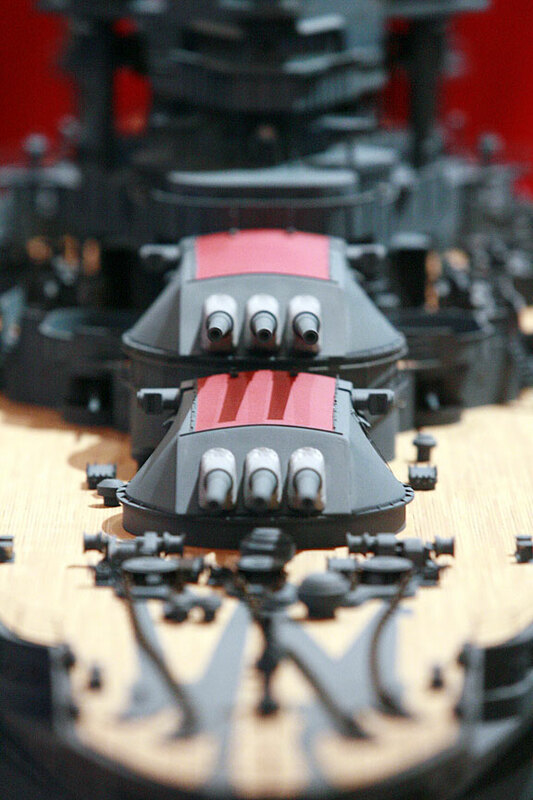 4 turrets were red." Kimmel's orders specify a rainbow of five colors to represent the different battleship divisions, painted atop the two front turrets of battleships. The aftermost turret top was to be painted in a color representing which aircraft division the ship belonged to. 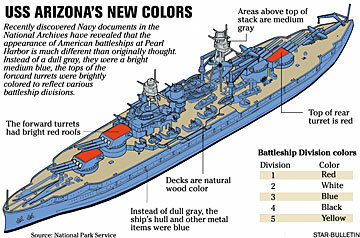 In the case of the USS Arizona, both colors were a bright red. The idea, explained Preul, was so aircraft could identify their own ships, and also see which ships were firing their cannon: "These battleships could throw shells 18 miles. The planes couldn't get close enough to read their names, so the bright colors helped." Preul, Martinez and associates including naval artist Tom Freeman met a few months ago to go over the orders and compare them to black and white pictures of the period. Their consensus was that the ships at Pearl Harbor were indeed painted in this manner. "It certainly raised questions about coloration of all the ships at Pearl," said Preul. "This is a topic that has raised a lot of controversy among historians over the years. It also reveals what an interesting time of transition the Navy was in at the time." "We had it wrong for 65 years," said Martinez. "Today, we have made it right."